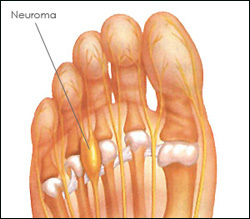 Morton's neuroma can make walking and performing normal activities difficult and painful. Treatment options vary with the severity of each neuroma, and identifying the neuroma in its earliest stage of development is important to avoid more invasive treatments or surgical correction. Left untreated, neuromas tend to worsen, so it's always best to visit our Irmo office at the first sign of pain. In the most severe cases, surgery may be recommended for patients who do not respond to conservative treatments. Daniel Methuselah, DPM can help you determine the best approach for your specific condition.